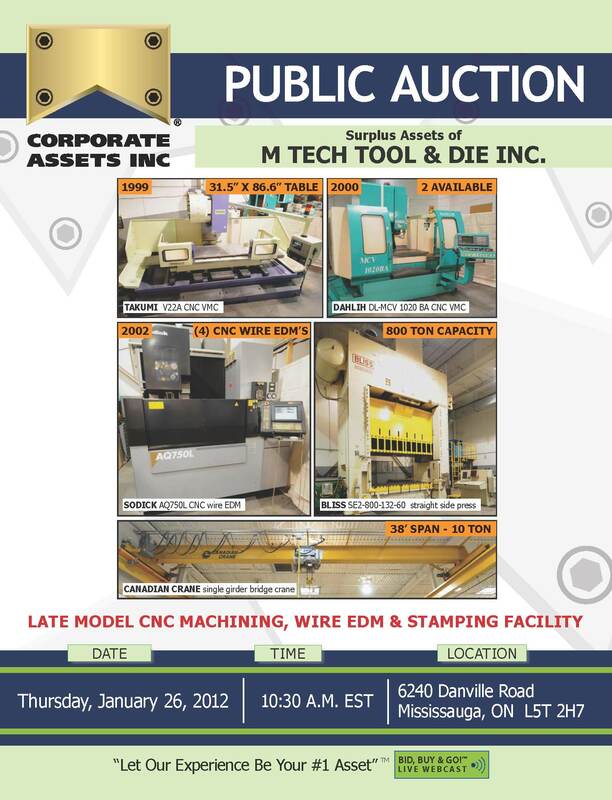 Corporate Assets Inc. | M Tech Tool & Die Inc. - Corporate Assets Inc. FEATURING: TAKUMI (1999) V22A CNC VMC, (2) DAHLIH (1998) DL-MCV 1500 CNC VMC, (2) DAHLIH (2000) DL-MCV 1020 BA CNC VMC, SODICK (2002) AQ750L CNC wire EDM, SODICK (2000) AP500 CNC wire EDM, SODICK (1999) A535 CNC wire EDM, SODICK (1998) A325 CNC wire EDM, MITUTOYO (1999) BRIGHT A910 CMM, (3) FORTWORTH (1999) VBM-5VL bed type vertical milling machines, KIHEUNG (1998) KBM U6 bed type universal milling machine, (4) KAO MING (1999) KMR 1600 DH 6' radial arm drill, KAO MING (1998) KMR 1100 S 4' radial arm drill, TONE FAN (1996) RD 100 4' radial arm drill, CHEVALIER FSG 1640AO hydraulic surface grinder, CHEVALIER FSG 1224 AD II hydraulic surface grinder, CHEVALIER FSG 1224 AD hydraulic surface grinder, (4) CHEVALIER FSG 618M manual surface grinders, (8) FIRST vertical turret mills, BLISS SE2-800-132-60 side press, MINSTER MS2-250-84-48 straight side press, (2) FEEDLEASE air feeders, (2) MECON motorized uncoilers, CANADIAN CRANE 10 ton, 38' bridge crane, CANADIAN CRANE 5 ton, 38' bridge crane, ROYAL25000 lbs forklift, CLARK 8925 lbs. forklift, machine shop equipment, air compressors, factory equipment, CAT 40, BT 40 tool holders, tool caddies, tool cabinets, parallels, racking, hand shear, granite surface plate, fasteners, steel, perishable tooling, strapping caddies, power tools, hand tools, pump trucks, lifting accessories, safety cages, fasteners, office furniture, business machines and more.